Goodbyes are always hard, and leaving Tamale was no different. Saying goodbye was difficult because I have grown fond of the city, it’s people, and even my life there. After grappling with the difficulties and frustration of moving to a new country and adapting to a completely new culture and way of life, six months is just enough time to begin to feel at home. After six months you have built a social life and support system, at work you feel comfortable in your position, know how to get things done, and understand all the office dynamics. You begin to feel a small sense of pride when you see how well you have adapted to your new life over the last several months. Even something as small as knowing the local lingo, knowing the correct price for a taxi ride, or just being comfortable walking through your neighborhood at 7 at night asking where to get Indomie noodles for dinner because you’re feeling lazy and don’t have any food in the house anyways. Even after six months you are still learning new things every day, and it is sad to leave that all behind. Most of all I will miss the people in Tamale whom I worked and became friends with. It was hard to leave not knowing when I might see again many of the great people I met. Upon returning to Canada everyone always asks, “What was the best part?” and that is a difficult question to answer. It is impossible to sum up six months in one sentence, or to pin point one event or one aspect of this experience that stands apart from everything else. I learned so much, not just about community development and international cooperation, but about myself as well. I gained lots of valuable experience, made many new friends, travelled to exciting places, ate lots of new and different foods, learned about a new culture and learned to live within it. It is impossible to choose the best, most exciting, or most important part. Whenever I do try and answer that question however, there is always a common thread, and that is the people. People whom I met along the way, whom I worked with, became friends with, travelled with, and lived with. When I think back on this time and the lessons I learned and the experiences I gained I will always remember the people who shared them with me, taught me, and supported me. 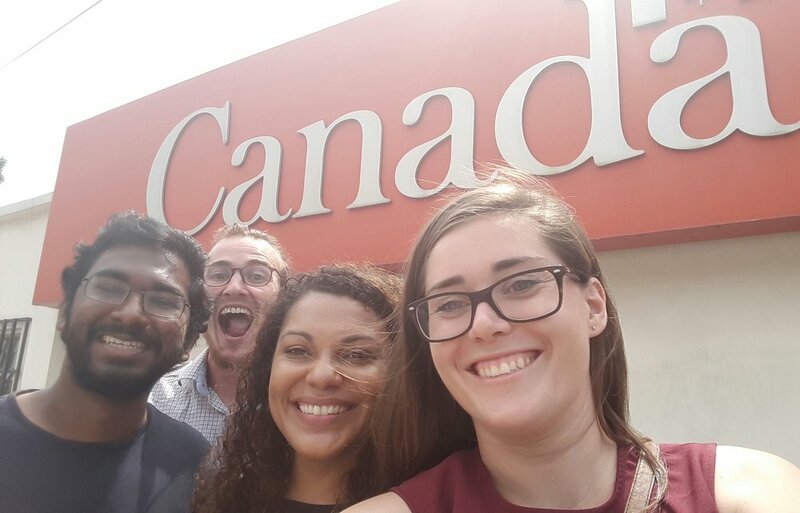 Myself, Natasha, Doug, and James in front of the Canadian High Commission in AccraIt is difficult to say goodbye not knowing if or when I will be back, but I know that I will always have the memories I made over the last six months. I will never forget the people or places that I grew to love in Ghana, and I know that I will take the experiences and lessons I learned there forward with me into the future! Travis Jacox was working as a Resource Mobilization and Management Specialist with Centre for Active Learning and Integrated Development (CALID) in Tamale, Ghana.